Most folks will tell you there are only 4 main seasons, Spring, Summer, Fall, and Winter. But in Branson, we have another season, Ozark Mountain Christmas. 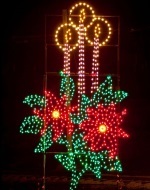 The season runs from November 1 to December 31. From Silver Dollar City on the west to Historic Downtown Branson and Branson Landing on the shores of Lake Taneycomo to the east, Ozark Mountain Christmas is filled with everything one would expect from a world class holiday celebration. From a spectacular five story high musical decorated tree; reindeer; Santa Claus; millions upon millions of beautiful colored lights and drive through lighting displays to Branson’s shows, attractions, shopping and other activities taking on the festive look and feel of the season, it is a wonderful world class celebration. It is a unique Branson wide celebration of the true spirit of a traditional American Christmas that has been celebrated for over two decades. Most of Branson’s regular season shows also perform Christmas shows which are typically a combination of the best of their regular season show and Christmas and are as unique as the show themselves.